Like many other aspiring jet jockeys I suspect..... 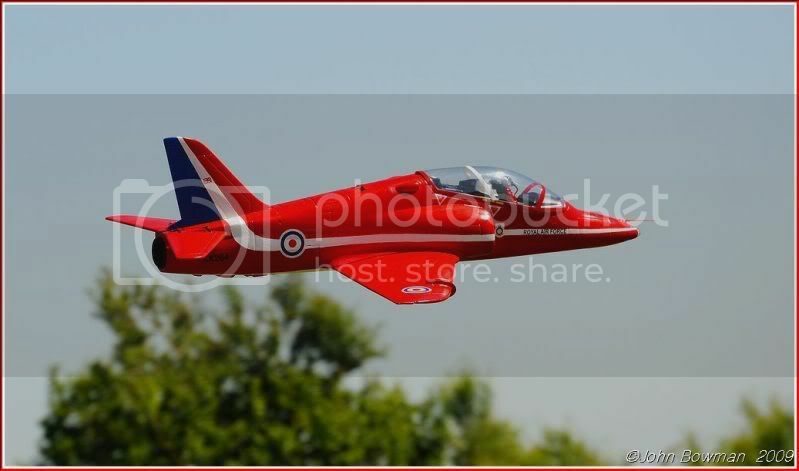 I have a soft spot for the BAe Hawk. As with that classic piston and propeller powered beauty - the Spitfire, it is an aeroplane that most people recognize without difficulty. Given that it is the current jet of choice for the world famous Red Arrows display team, it's hardly surprising that world wide fame was its destiny. Almost pretty in appearance, yet menacing too, it has all the qualities of a heart stopping steed. Many propeller variants have been modelled over the years, in both tractor and pusher versions, yet it is one power model I have actually never owned in all my 30+ years of aero-modelling. You see, just like George Michael..... I've been waiting. Somehow, I just knew that one day a manufacturer was going to release a proper "Jet" powered version at reasonable cost. There were several i.c. ducted fan variants back in the 70s and 80s, but these were fairly complex, noisy and pretty expensive. With the advent of reliable miniature turbine engines arriving on the scene several years later, the performance and reliability improved and I'm sure most who have seen the brilliant Ali Machinchi Junior fly his lovely example would agree that they make superb model jet aeroplanes. There are however a few snags. Turbine engined scale models require strong and light composite airframes, suitable and somewhat scarce flying sites, complex onboard systems management and of course, fat wallets. The advance in EDF (electric ducted fan) technology has seen several model Hawks emerge over the last few years, but again, none have quite hit the spot for me - mainly due to them being too small, too expensive, or marginal in performance. Rapid development in brushless motors, Lithium batteries, and lightweight foam based airframes has now made the potential for a good sized EDF Hawk a reality. It was with some excitement then, that I received a call in the early spring of 2008 from my friend and RCM&E forum regular Scott Cuppello of E-Flight Cumbria (now EDF guru at BRC Hobbies) to tell me of his latest import from the Chinese company Fly-Fly. 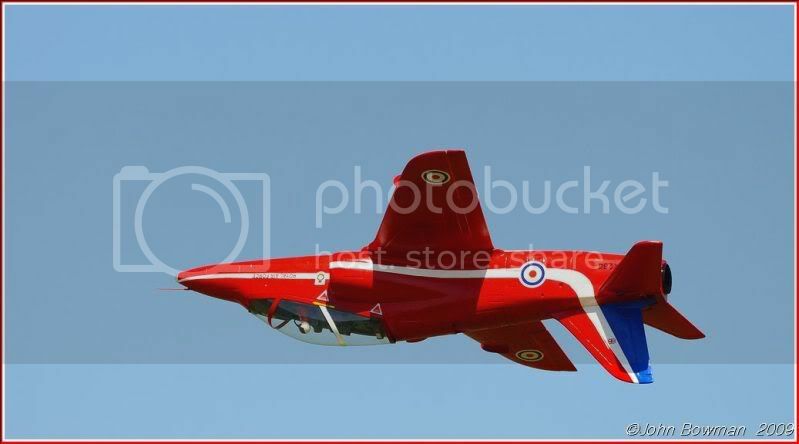 That's right - a turbine sized EDF Hawk, resplendent in the Red Arrows colour scheme, complete with 90mm fan and retracts; all for the price of just a set of half decent retracts alone on a gas turbine job! After only the briefest of discussion with Scott, but a slightly longer discussion with my long suffering wife, a very reasonably sized cheque was winging its way up north! All that was required now was patience, in the anticipation of a nice big box arriving at the door. A week or so later posty did his stuff and the heavy duty cardboard box arrived. As I am un-wrapping it, I can't help thinking that the magical powers of the East have been at work - because the box although big, is only 40inches long, yet the specification states wingspan 54 inches, fuselage length 56 inches. All is soon revealed, and the answer is as simple as it is clever. Those of us who have a few foamies under our building belt are well accustomed to glueing 2 x fuselage halves together - but this fuselage is in 4 x quarters; split both side to side and lengthwise. This has obviously reduced the shipping costs; savings which in turn have been passed on to us, the customer - nice one Fly-Fly! First impressions are pretty good, all the main sections are of reasonable density, painted EPS with just a few separate vac-formed plastic ancillaries such as under-wing covers, wing fences and so on. Parts such as the retractable undercarriage, laser cut ply fittings and other hardware are all packed in separate sealed plastic bags, as is the lovely big cockpit and huge clear canopy no pilot though, so this will have to be remedied, as an office this big is really going to look empty! The main airframe sections are bubble wrapped and the whole lot is packed in such a way as to prevent pieces from moving around inside the box. Unfortunately, despite this, one or two areas had suffered minor damage mainly to wing and fin tips. I also noticed that the ailerons were pre-fitted, but the tape was already beginning to loosen - this would also need attention for sure! I couldn't resist a quick mock up there and then on the garage floor - and oh boy - this is one big foamy! With a fuselage length just short of 5' it has to be shoe-horned into my car's passenger compartment, as the boot - even with the "ski hatch" down - is just too darn small, big enough though thankfully to accomodate the removable one-piece wing. The oversized jet intakes make the fuselage appear positively huge at its widest point - adding to the impressive overall appearance of what is, after all, only a foamy model. The target weight as stated on the box is 5.3lbs ready to fly with retracts - mine came in at a tad over 6lb - more on this in the build review in part two. Monday June 1st 2009 dawned wonderfully hot and sunny, with a nice cooling wind for good measure. Personally, I like a bit of a breeze for model flying - even maiden flights, and as I often used to say to my R/C pupils as I marched them off to the flight line in a force 4 gale..."the wind is your friend" increasing lift, allowing slower flight, and most importantly slower approaches for that all important landing! All these attributes would be welcome with the Hawk, as I was slightly concerned that my over-zealous use of the glue bottle and paintbrush etc. had made her akin to the pilot eg: somewhat overweight! I had three major areas of concern, namely the power to weight ratio and its resultant flight performance, the retractable undercarriage which I had elected to fit (well you just have to don't you on a model like this).... and lastly the integrity of the all-moving tailplane arrangement - built as per plan incidentally. 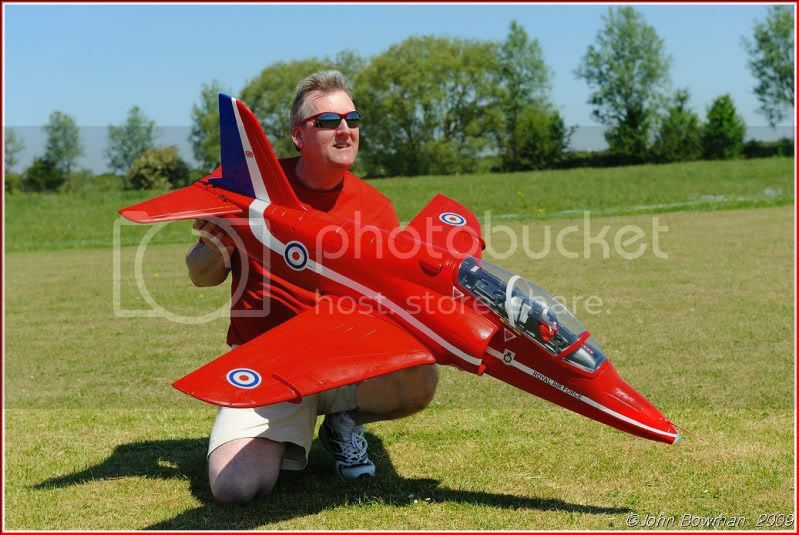 A phone call to fellow RDMFC (Rhyl and District Model Flying Club) clubmate and ace photographer John Bowman confirmed his availability for a morning sortie down at our club strip. Praying that our groundsman had been busy with the mower whilst I had been on holiday, my ground crew (Mrs Timbo) and I arrived at the field to find John and team already there, together with another flyer, the ever friendly and extremely talented Mr Will Bertoni. The strip was examined whilst the 6s FlightPower Li-Po battery was given a final charge to full potential. The grass had obviously been cut in the last few days, so it was deemed "fit for purpose". A quick thumb stretching and wind testing flight was made with my trusty ALFA Sabre, followed by John's ground and static photoshoot. A range test of the Spektrum DX7 and AR7000 radio system confirmed all was well and the model was placed at the far end of the grass strip, facing dead into breeze, I assumed position in the pilots box, giving the sticks that last little twiddle - as you do - to check that all was well. WOT saw the Hawk overcome the drag of the grass on the rather small wheels, and after a few seconds of 'spooling up' she set off quite briskly, requiring just a little input to the steerable nosewheel to keep her tracking true and straight. The higher than designed AOA that I had carefully built into the model during construction seemed to pay off, as the ROG came a little sooner than I had expected. Concerned that the airspeed may be a tad low, especially with all her dangly bits still hanging out, I deliberately held back on the climb out as the Wemotec midifan reached full RPM of around 33000. Gear up, and a gentle climb out straight ahead resulted in a noticeable speed increase - not ballistic by any means - but sufficient to "feel right". Banking away to the left, I then set in 2 clicks of down elevator trim, and settled down for a full circuit. A fast turn heading back to the flightline downwind showed her off to great advantage, and I could hear John's camera motordrive furiously clicking away as she approached the pilot's box. Straight up into a half loop and half roll off the top, and down she came back to the strip for a fast low pass. On the very next circuit I was happy enough to explore inverted flight, rolls, and hard banking turns. In my mind's eye was that sloppy tailplane linkage setup, but this proved to be more than up to the job, with all pitch movements performed with no hint of trouble - she just tracked through the loops straight as a die. Inverted flight required a little more forward pressure on the stick than I expected, indicating that perhaps the chosen COG (as per plan) could be a tad forward. Static testing of the powertrain earlier in the year indicated likely flight times of circa 6 minutes, and as my Tx timer sounded 5 minutes, I dropped the gear for a dirty low pass to check that all bits were dangling as required. I took her out wide and far, my now sunburnt face having assessed that the breeze had dropped somewhat so deciding on a long approach to prepare for that all important touch down on those spindly retracts. 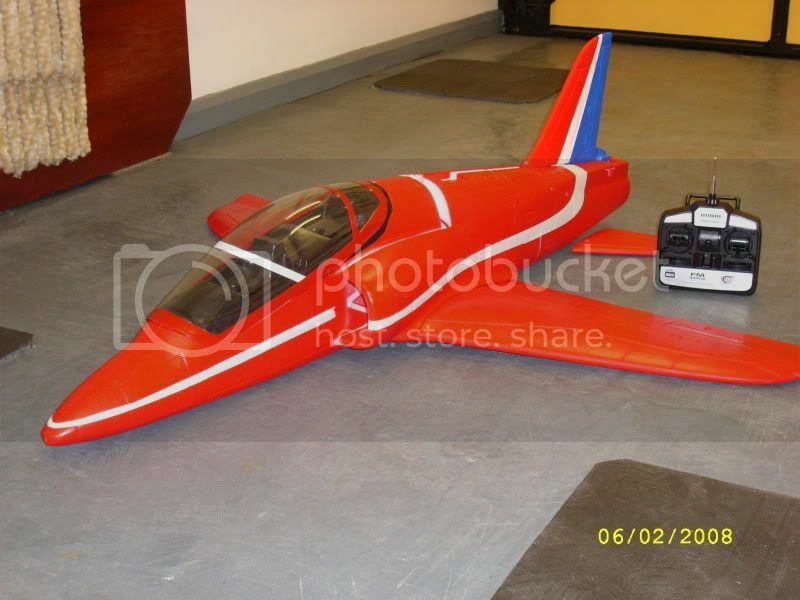 This was the acid test - and a long standing worry was about to be put to the test - would the 6lb+ bird just be too heavy for the legs and inevitable drag and braking effect of the grass strip? I lined her up into the now fading breeze, and let her sink down to around 15 feet off the deck, a good 50 yards from the edge of the strip. Maintaining altitude with the throttle set at around 25% I gradually eased back on the power, and let her settle down right at the edge of the strip, about 2 feet above the runway. Pulling the go stick right back to off, she eased down onto the mains, and a quick flare to keep the nosewheel airborne saw her then slow down enough to settle her nosewheel nicely back on the deck. Everything seemed to have remained in place, so I blipped the throttle and steered her back to the pilots box for full shutdown. The countdown beeping of my Tx alarm started just as the model stopped in the pilot's box - indicating pretty much a six minute flight as expected. The battery came out hot, but not overly so, and considering the very high ambient temperature, acceptable. Post flight checks showed all to be in order, so all three earlier concerns were put aside. The P/W/R was acceptable, with the Eagle Treee logged inflight data showing a peak power of 1035 watts, and average of 685. That equates to a WOT figure of 170 watts per pound, and an average figure of just 112 watts per pound. Cumulative consumption from the 3200 MaHr battery was 2867 m/a. The 1600 Kv HYK "blue can" motor was hot, but again, like the battery, not worryingly so, and was obviously spinning at close to its theoretical speed as the data showed the battery holding an average voltage of 21.4 V over the six minutes. 21 Volts X 1600 = 33600 RPM and logged RPM showed as 32300 so pretty close, allowing for the fan loading. Servo current consumption averaged just 1300 mahr throughout the flight, with peaks of just over 2.2A. This figure includes the current drawn by the ESC itself for throttling purposes - proving once again, that we do sometimes over-worry about radio battery capacity. I had chosen to use a Turnigy 5A switching UBEC to service the Rx and 6 x HS65 servos, including 1 x metal geared unit for the steering, and 1 x for the retract air valve. A second battery was fitted and a further flight was completed. This ended prematurely as the battery failed to hold up past 5 minutes, with LVC kicking in whilst still on finals. The gear was quickly retracted as I realised that I would not make the strip, so chose to belly land her in the long perimeter grass. No damage was sustained at all, and I went home a happy man. She flies very nicely, has a good "sit" in the air, and certainly looks the part - unmistakably a Hawk, and at a distance hard to tell apart from a full composite and way more expensive "proper" jet. I think with the extra weight gained (more on this in part two " the build ") a more powerful motor would be useful; perhaps a slightly lower Kv motor running on 7 or even 8S LiPo - retaining the exellent midifan, should see the power increase quite significantly. Of course, one then enters the dreaded world of more power = more weight spiral, quite apart from higher cost! Better really to try and keep the weight down if at all possible.